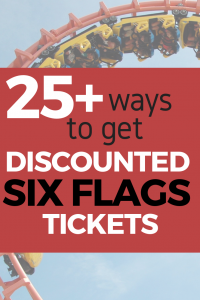 If you’re thinking of spending the day at Six Flags soon, don’t just head to the gate and pay full price as I wanted to share some specific cost-saving strategies you can use to save big! With over 16 locations across the United States, a full priced adult ticket could cost you north of $90; however, with a pinch of planning, it’s quite possible to pay much less. Let’s dig in on the many ways to save at Six Flags today. Before I start to talk about the various Six Flags discounts you can take advantage of, I wanted to show you the full ticket price you would pay if you went directly to the gate as this can give you an idea as to what you would pay at a maximum if you had no discounts applied. This list applies to United States locations only. As you can see, the prices are quite hefty at the gate, and I can’t stress it enough in this guide — DON’T pay full price at the gate as I can almost guarantee you there are ways to save. If you plan on visiting the Six Flags city for a few days, I highly recommend the “GO Card,” which allows you to visit as many attractions as you can, including Six Flags in some cities, in a certain amount of days. For example, if you purchased an all-inclusive five-day pass, then you could visit all of the attractions on your card an unlimited amount of times for five days. The card will then become active on the first day you use it. First, you’re going to want to go to the main website and choose a city that you plan on visiting. Right now, the company works with more than 15+ major U.S. cities and hundreds of attractions, so there’s a good chance you will find a city of interest. So there could be a good chance some cities won’t be available. From there, you can then either pick out an all-inclusive pass, which includes all of the attractions on your card in that particular city, or you can build your own, technically saving up to 20% off the rates. The choice is yours. Then, once you buy it, you will show your phone at the gate as this will act as your entry ticket. And as mentioned, your card timer will start to roll the minute you attend your first attraction, so you will want to make sure you use it wisely and schedule your attractions ahead of time! To put it into perspective, a 3-day pass for Los Angeles, which included Six Flags, would cost $219 a person, but this would include more than 35 attractions. So even if you dedicated one day to Six Flags at an $80~ value, you could easily get your monies worth on the other attractions. In short, if you play your cards right, you can EASILY save 50% off, trust me. Again, I highly recommend this route if you’re planning on staying in the city for a few days and want a huge list of things to do without having to worry about buying tickets and/or the price. You check out all of the cities as well as the attractions here. In some cases, people often buy tickets and then find out they are unable to attend the park. And since you can’t get a refund, you’re only left with one option — selling them. As this happens a lot more than you think, check out eBay to see if you can find anyone unloading their tickets. That particular listing was $20 for ONE ticket, an almost $60 savings if I used it at the most expensive park, for example. While eBay can be a gold mine, just be sure you’re dealing with a legitimate seller with a lot of positive feedback before buying. Also, make sure you use Paypal to ensure there’s a paper trail for your payment as well in case something happens. 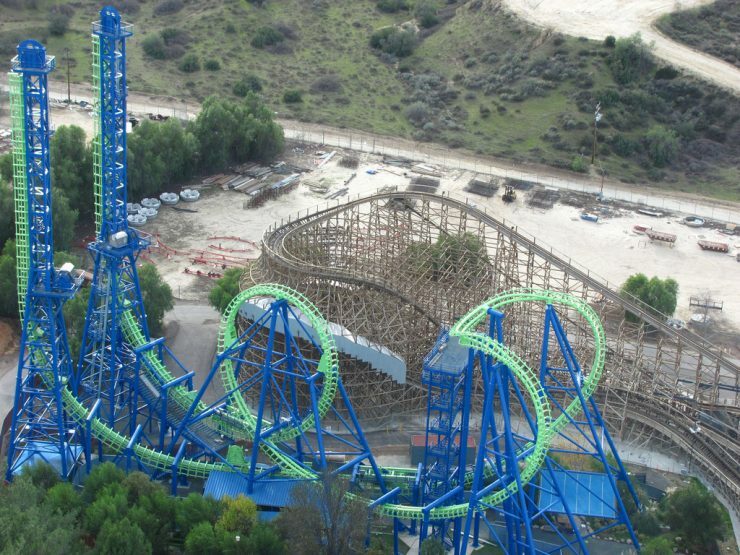 To see the current Six Flags discounted tickets on eBay, you can view the current listings here. On occasions, Six Flags will advertise on Groupon, offering buyers significant savings and even bonuses in some cases, but don’t be surprised if no active listings are available. These deals are rare. For example, last summer, I found a book of free gift certificates to local businesses in the San Antonio area as well as four general admission tickets to Six Flags Fiesta for $99. That’s almost as good as buying one, get three free! While there’s no guarantee you will find a deal on the website, just check it out and search to be certain. By far, one of the most popular ways to snag is a Six Flags discount is via a coke can, which can commonly be found at a grocery store near the park. They run this promotion almost EVERY summer. And to find a grocery store, almost any major chain, again, near the park, will have the cans in stock as long as Coca-Cola is running the promotion. Generally available during the summer months, all you need to do to take advantage of the offer is simply by bringing the can, preferably empty, to the box office before you buy your tickets. And aside from bringing in the soda can, the amusement park will hold promotions in conjunction with Coca-Cola as well. For example, as I writing this, the amusement park would let you get the rest of the year free if you purchased a season pass and showed a Coca-Cola can at the gate. With the average can saving you up to $21 per ticket, be sure to read the restrictions as some do apply, such as when you can use it and/or how many discounts you can take advantage of. Don’t have a Coke can or can’t find one? Some have had luck using the promo code “COKE” when buying tickets online. So be sure to try the code out to see if it knocks a few dollars off. Like the Coca-Cola cans, Six Flags often partners up with certain brands to offer you additional savings. And this can include promotional codes to use online or even a paper ticket you can bring to the gate. Finding these product partnerships can be hard sometimes, so the only word of advice I can recommend is either setting a Google alert to be alerted when a special deal is available or referring to the company’s https://www.sixflags.com/america/partnersofficial partner page. And if you’re able to find a partner, these coupons are either available on the packaging or sometimes on the website. If you’re a current AAA member, then the good news is that you can save up to 30% off your admission tickets. To take advantage of the offer, flash your card at the gate and save $5 off the general admission prices noted above at the park or $2 off at the water parks. Aside from saving money on tickets, you can also get 10% off all gifts, candy any photo products once inside the park. 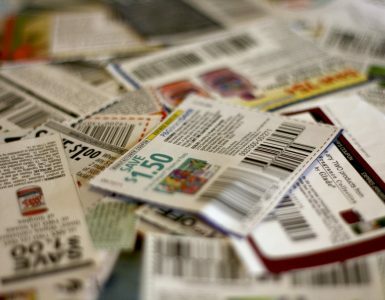 Sometimes, Costco will have Six Flags tickets up for sale at a discounted rate, usually next to the discounted gift cards and other attractions toward the front of the store. Trust me, if you shop at the store, you are probably well familiar with those cardboard cutouts. And to see if the company is currently selling the tickets, either search for “Six Flags” on the official Costco website or visit a warehouse to browse their selection. Aside from the Coca-Cola method I mentioned above, many grocery store chains, again, nearby the park will offer heavily discounted tickets when you purchase in store at the customer service desk. For example, in 2018, Jewel Osco grocery stores sold general admission tickets for $54.99, an almost $20 savings off the gate price. Other grocery stores may partner with the amusement park as well, so it doesn’t hurt to check with customer service and/or the grocery store’s official website to see if any discounts exist. According to the official FAQ, military members can receive discounted tickets at their MWR/ITR office. Or if you head to the gate with a valid military I.D., you can get 20% off a general admission ticket. If you have a military ID, 20% is a pretty easy way to save without having to search online. Now, you may be wondering how you can get a promo code and how much you could save if you had one. Well, it’s hard to say since, like most coupons, these promo codes come and go. Sometimes you could save a few dollars, whereas in other cases, you could get a free upgrade. Before you use this promotional code, just make sure it’s the best way to save in comparison to the other methods I mention on this list. Read to Succeed – Get a Free Child’s Ticket! Read to Succeed is an exciting program which encourages your child, grades K through 6, to read for fun. And any child who completes six hours of recreational reading will receive a FREE six flags ticket; it’s that easy. If you’re interested, you can read more about the eligibility rules and can sign up here. By far, this is the easiest way to snag a FREE child’s ticket. Purchasing your tickets at the gate will ALWAYS be the most expensive option, so I highly recommend you avoid this at all costs as you will never save any money buying directly at the gate. These types of tickets can save you up to 40% off, but as the ticket name implies, you will have to choose a certain day to receive this discount and show up on that day only to enter the park. 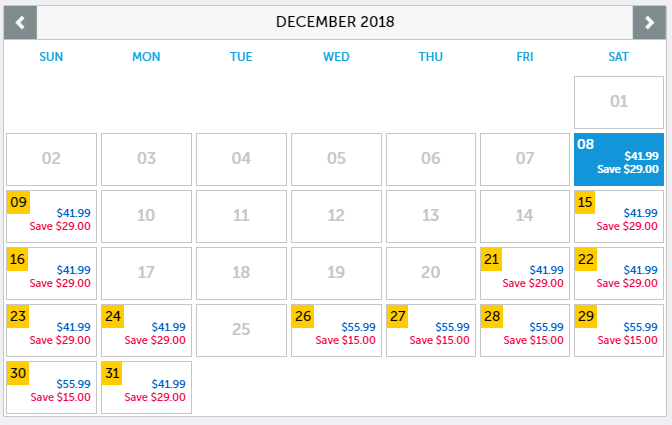 The great thing about this type of ticket is that you can open an interactive calendar (as seen below in the screenshot) and see which days are the cheapest, making it a very easy way to see when it’s the cheapest time to go. At this particular park, if I went on the 8th and paid $41.99, this would be a $29 savings, almost half off! But as you can see, the 29th would cost me $55.99, about $14 more. To find this calendar, head to this link, choose your park and then select the “Choose Your Day Tickets” option to open the fare calendar. If you plan on going to the park more than once in a year, then you may want to consider a season pass, even if you plan on visiting multiple Six Flags locations. A season pass, depending on the tier you consider, can average less than $6 a month, making it easy to budget for the year since you don’t have to pay the lump sum up front. 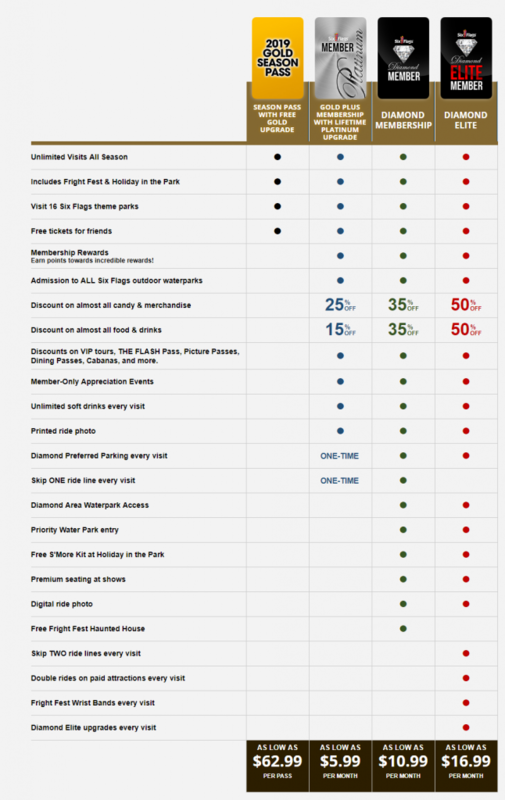 With a few tiers available, I did break down the inclusions as you will get more than just admission to the park, as seen in the screenshot below. Also, keep in mind that the prices, much like the admission prices noted above, will greatly vary depending on the location you choose. Use these prices as an average. If a season pass is of interest, I highly recommend you wait until Six Flags holds a sale as this is a way to take advantage of even more benefits, such as free upgrades, free parking, additional months, free food, etc. As for season pass discounts, they are available, but as a word of advice, consider checking during November or December, commonly referred to as the Flash Sale, as the amusement park will often run promotions, such as getting the rest of the year free or even upgrading your pass. Know Someone with a Season Pass? If you know of someone who currently has a season pass, then you may want to ask them if they can take you one of the many “Bring-a-Friend” days. Generally, you can find these bring a friend dates with a quick search on the company’s website to see when they are active. During these special days, season pass holders can bring in one friend, per pass for FREE. So if you knew a family of four, this could be four free potential passes! Of course, don’t be a cheapskate. Offer something in exchange, such as paying for a meal or even giving them money for the tickets. As long as you’re attending the park with more than 10 people, then Six Flags will be more than happy to offer a group discount to companies, schools, youth groups, religious organizations, reunions, associations and travel groups, to name a few. And from my research, group rates tend to be up to 52% off per ticket, all depending on how many people are in the group. For example, 15 or more tickets will save you up to 52% off, whereas 10 to 14 tickets can save you up to 45%. To learn more about group discounts, you can refer to the official rates here to see how much you save. 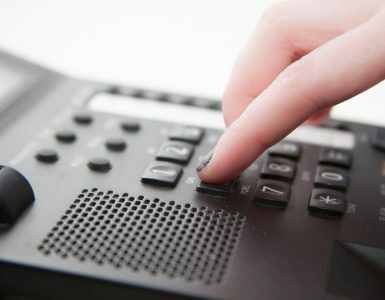 If you work with a larger corporation, check with human resources to see if they potentially partnered up with a company called TicketsAtWork. In short, this company partners with thousands of corporations and offers special discounts on many travel perks, including Six Flags tickets, all for a rate much cheaper than what the general public can receive. Again, to create an account, you will need an access code from your Human Resources department. And if you’re able to get one, you could buy tickets at a pretty good rate. For more information, refer to this FAQ to see how you can take advantage. If you’re going to need a hotel during your Six Flags visit, consider looking for a hotel package that packages both the tickets and room together. To find these hotels, there are a few options to consider. For one, you can refer to the “special offers” page on the Six Flags website, where you can find all of the hotels in the area that offer a room and ticket package, along with the prices. Or if you want to do a pinch more work, visit the hotel websites in the area to see if any packages exist. You could even call the hotels as some offer ticket packages and a free shuttle to the park, helping you avoid the parking fees. Bundling your hotel and tickets can be a good deal in some cases, but not always, so I recommend you price the tickets and hotel room separately first to see if the bundle makes sense. Like the eBay strategy I mentioned prior, Craigslist can work just as good; however, since you do have to meet up in person and more than likely use cash, you’re really putting yourself at risk if you happen to buy fraudulent tickets. To find these tickets, just make sure you’re using the closest city to the park on Craigslist and search in the “for sale” section to see if any deals are available. Again, if going this route, do so at your own risk and always make sure you meet in a safe area such as a police station. I’m a huge fan of Slickdeals, and if you haven’t bookmarked this massive deals website yet, I encourage you to do so as this deals community is one of the best. And since this community is pretty fast at finding deals on just about anything, you may want to set up an alert to notify you in the case of a Six Flags deal. That way, you can act on it before it expires. Or if you just want to browse and bypass the alerts, that’s fine as well since you can use the website’s search function to see the current deals, if any are available, right now. Now, to set alerts, it’s extremely easy and takes a matter of seconds. Just click on the “Deal Alerts” tab, followed by clicking on the “Create and Manage Deal Alerts” button beneath the tab. Once you add the alert, Slickdeals will then either email and/or text you, depending on your filters, anytime a great deal pops up. Then, it’s up to you to jump on it if it’s a deal you want. As I have mentioned in a lot of posts, I recommend you set up deal alerts on just about anything you’re interested in to ensure you’re getting the best deal. Apparently, according to some sources, you’re much better off buying your Six Flags souvenirs, either online via a third-party retailer, such as Amazon, or directly from the Six Flags website itself. Bypassing the souvenirs will not only save you a ton of cash, but you won’t have to worry about lugging the trinkets around as you enjoy the park. 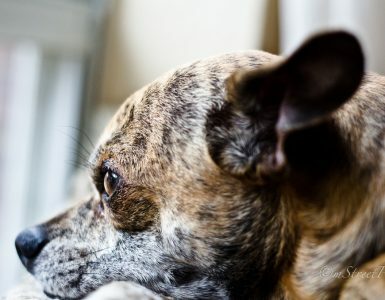 If you truly want to be frugal, consider taking some pictures and printing your favorites at home. The lockers at Six Flags are up to $18 for the days and are available on a first-come, first-serve basis. As you can imagine, not only is the price not worth it, but you’re going to have to go back to the locker every time you need something. Instead, consider bringing in a backpack to tote around your belongings or a wagon if you’re bringing along the kids. The Flash Pass is a premium perk which allows the system to hold a place in line so you can spend more time around the park. Then, when it’s time to ride, you show up and your wait time is reduced by more than 90%, greatly depending on which pass you buy. Yes, while the Flash Pass could make sense when the park is busy, consider visiting the park when no one is there so you don’t have to wait regardless. If you’re flexible with your times, refer to the Crowd Calendars on IsItPacked.com to know what it’s the best time to go. Any amusement park, not just Six Flags, is going to be costly when it comes to eating lunch, dinner or a snack. And I’m talking about $15 for a simple meal. As for eating, you have a few options. For one, you can load up before you even enter the park. This could be at the hotel or even at a cheaper restaurant nearby if need be. Secondly, you can leave the park, get your hand stamped and then eat your lunch in the car. In this case, you could pack a cooler and load it with drinks and sandwiches to tide you over for the rest of the day. While you could leave to a restaurant, you’re going to want to eat as fast as you can so you can get back to the park as soon as possible. While the season drink bottle, a promotional cup that offers free refills for the year, seems like a good deal, let’s face it, you shouldn’t be drinking soda anyway. To stay hydrated, consider bringing in a reusable water bottle as Six Flags has refill stations located throughout the entire park. And if you forget your water bottle, that’s okay since concession stands will be more than happy to offer a cup of water for free. Don’t pay for your parking at the gate, but rather, purchase your parking pass online, either via the company’s website or even eBay to receive a parking discount. Doing so can often save you more than 50%, and it’s much easier to hand over your pass than have to worry about having cash on hand. Like the tickets at the gate, buying your parking passes online is often the best bet. In some cities, be sure to check out the local bus routes as some bus stations are located right outside the park, which is a great way to walk to the park without having to pay the parking fees. And if you’re staying at a hotel near the park, see if they offer a free shuttle to the park. If possible, this is the easiest way to park for free! Lastly, if you feel you’re going to be tempted to buy something you shouldn’t, consider bringing cash into the park and that’s it. That way, you know exactly how much you can spend, and once it’s gone, well, it’s gone. 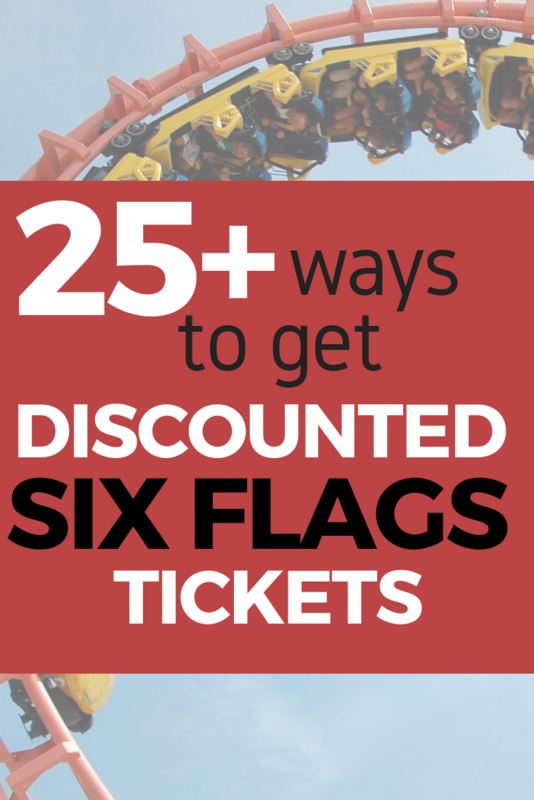 As you can see, there are a ton of ways to save if you plan on visiting any Six Flags location. While there is no right or wrong way to save, there’s one thing for certain — NEVER pay full price for a ticket as there is ALWAYS a way to save. In conclusion, I know you can save money if you take a few minutes out of your day, and trust me, it’s worth it. Even if you’re saving $15 per ticket, that’s still a $60 savings for a family of four. If I’m missing any savings tip, let me know! I will be more than happy to add them to the list if it can help other save.